Preheat oven to 400°F. Arrange the broccoli and cauliflower on a baking sheet and drizzle with 2 tablespoons oil. Place the garlic head in a small piece of aluminum foil and drizzle with remaining oil. Fold to seal. Place on baking sheet with veggies. Sprinkle the veggies with rosemary salt (or regular salt.) Bake for 30 minutes. Melt the butter in a small saucepan over medium. Squeeze the roasted garlic cloves out of the skins into the pan. Add the chopped rosemary and mash everything together with fork or wooden spoon. Add the flour and whisk until combined. Might need to do a little more mashing. Add the milk and a pinch of salt; whisk until thickened and creamy, about 5 minutes. Off the heat, add the grated Parmesan cheese. Stir to combine. Transfer the roasted veggies to a small casserole dish and pour the cream sauce on top. In a small bowl, melt the remaining tablespoon butter and add the panko. Toss to combine. Sprinkle the panko over the top of the casserole. Bake another 20 minutes, or until browned on top. Can you believe Thanksgiving is like 15 minutes from now? Whaaaaat. I especially can't believe Thanksgiving is that close because I have two little munchkins inside me about to escape from belly prison like bandits on the RUN. These babes are active and insano in the belly membrano. But I'll take it. 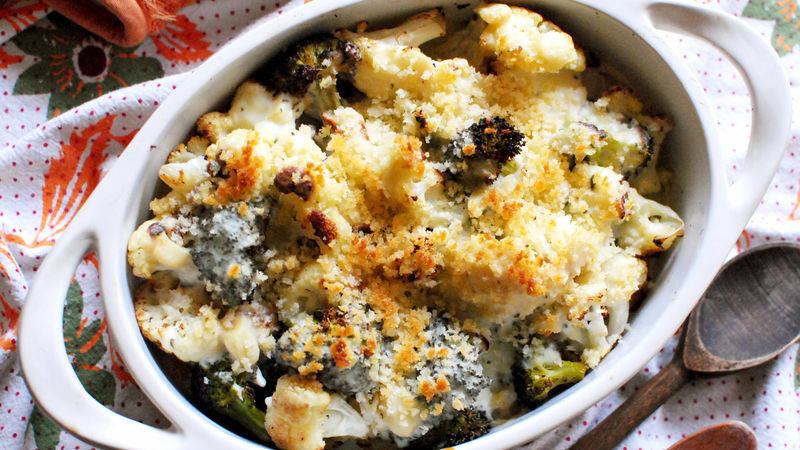 Just like I'll take this dang Broccoli and Cauliflower Casserole we've got goin' on. It's infused with rosemary and roasted garlic and smothered in a cream sauce and topped with crunchy panko and OH. Okay, so first get your broccoli and cauli broken into little florets. Done. Then ya slice off the end of your garlic head and wrap it in a little foil. Drizzle some olive oil over it. Magical things are about to happen in that there oven of yours. Then you'll melt some butter in a little pan and add the roasted garlic cloves, along with some freshly chopped rosemary. Smash it as best you can! Then add the flour and keep smashing until the cloves are smooth and...smashed. Add some milk and cheese and get it all creamy and dreamy. Pour the sauce over the veggies (which you've transferred to a small casserole dish) and look into its eyes. Top it with panko. Oh my heavenly face. And there it is. All baked and bubbly and creamy and calling out your name. "Lovah….oh lovah…" Did I just say that out loud? Bev just finished it and needs to lie down. She's so happy. For more musings visit her blog Bev Cooks and her Tablespoon profile.